Today we drank delicious hot mulled cider (thanks Tim!) and made S'mores out on the lawn. One luxury I really enjoy about my job is the requirement to travel, whether it’s out of the country or to neighboring states, I enjoy being on site and able to see our work in tangible form. Something I’ve noticed over at least the last decade on my travels for business, and especially those for pleasure, is the evolving “food life” throughout the country. Going out to dinner twenty-five years ago meant something completely different than it does today- and it really has become an enjoyable adventure. Even during the last 10 years, there’s a real revolution that’s happening with food and dinning when you travel. It’s no longer about going to a big name chef or the most glamourous restaurant; it’s about finding young and creative people trying new and interesting things – things that haven’t been done before in a particular place. It’s much more fun to find people who are being creative with their food and the space that they’re in. Take for instance, food trucks. Gone are the days of the greasy fair food vendors – food trucks have become even more interesting than restaurants. It’s like “gorilla art” for food. If someone wants to try something interesting – they can do it. They want to do it in a new place, and with a new audience – they can do it. The new chef doesn’t necessarily need to have all of the overhead of a bricks and mortar restaurants. They can experiment and play. And we – their audience – can enjoy their energy and insight. It is exciting and inspiring. Thank God Tim keeps our fridge constantly stocked. 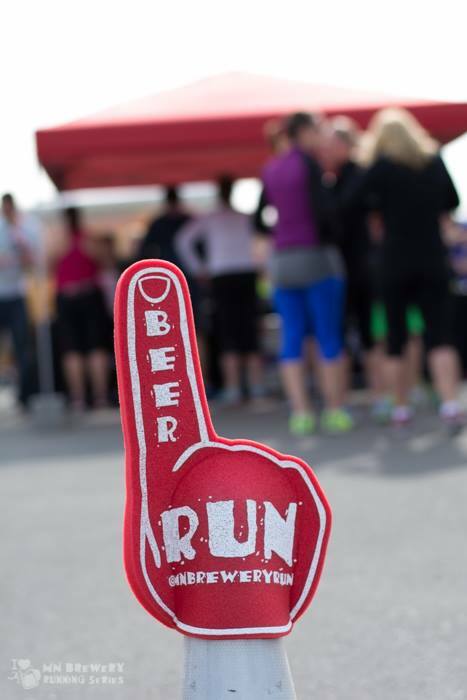 The MN Brewery Running Series is a series of events revolving around being active, drinking beer and supporting Minnesota’s local communities. Participants run a 5K course and then drink beer. What a fantastic concept! My colleague Brita and I decided to run the Surly Brewing event. The new Surly Brewing building is set in an industrial area between St. Paul and Minneapolis. The building reflects the surrounding train yards and grain silos – but is reminiscent of traditional beer halls found in Germany, with its balconies above that look over the main beer hall. The building was designed by local architecture firm HGA. Check out the photos! And if you make it to the brewery for a pint, I recommend the Cacao Bender. Divine!